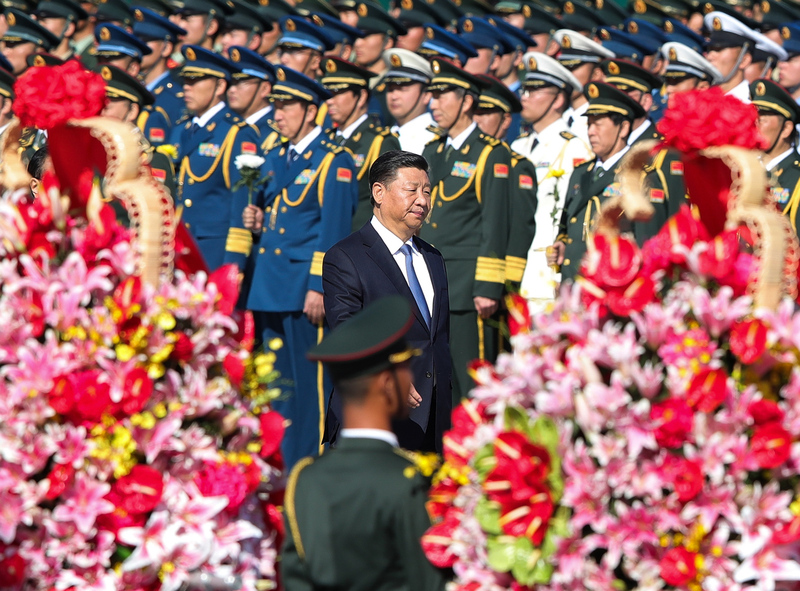 Chinese President Xi Jinping (center) attends a ceremony at Tiananmen Square, in Beijing, on the eve of National Day, September 30, 2018. Mao Zedong has come to this farm of ours. The iconography is so distinctive, and yet its profound political meaning in the present is apparent only to those for whom the ghosts of the past are visible. Like imagery was employed in the 1950s in reference to Mao Zedong, and to Hua Guofeng. But it was never used for any of Xi’s reform-era successors. Not for Hu Yaobang or for Zhao Ziyang, nor for Deng Xiaoping, Jiang Zemin, or Hu Jintao. Relapse is Xi’s signature. And once you understand this principle, you can apply it to better understand the core features of many of China’s ostensibly “new” policies. Which brings me to one of the newest changes in recent weeks: the introduction in August of the second revision of the Chinese Communist Party’s internal discipline regulations in less than three years. Taken as a whole, the revised regulations are not dramatically different from the previous 2015 revisions. Not in the sense, at least, of adding explicit new restrictions on the conduct of Party members. The bulk of the new language has to do with broader ideological principles—and, more specifically, with the formulations around which Xi has sought to construct and consolidate his power in the realm of discourse. Other new passages are not about rules or restrictions at all, but re-statements of the leadership’s resolve. An added passage, for example, simply states that the Party has not flagged since the 18th National Congress in 2012 in its pursuit of violations of the so-called “Eight-Point Regulation,” referring to Xi’s guidelines calling broadly for greater thrift, less sumptuous dining, and other forms of belt tightening (including shorter speeches). Discipline in this year’s revised regulations, then, was not just tightening around online speech; it was tightening across all forms of speech. But the strong emphasis on the Internet, and WeChat in particular, in official coverage online made sense on a much more practical level. Underscoring the seriousness of violations through any medium, the new language in the regulations reads: “On major questions of principle, if language or conduct does not cohere with the Central Committee of the C.C.P. or has harmful consequences, a warning will be issued, or for severe cases punishment rendered; for relatively serious offenses, posts within the Party may be revoked or [members] placed on observational probation; for serious offenses, the punishment will be expulsion from the Party.” But this language isn’t really new either. It simply repeats language appearing in bullet form further up in the document, in Section 2—language that also appears in the 2015 version. Clearly, the Party’s claim over the discursive space of its members does not really change with these revised regulations, unless we assume that space diminishes in proportion to repetition. But what about those “major questions of principle”? Do the new regulations address any new territory on that count? Yes, and no. This brings us back around again to Xi’s signature relapse. Most of the content added in this round of revisions has to do with one thing only: the power and position of Xi within the Party, and his demand for loyalty. The revisions use disciplinary regulations to send the same essential message we see in the iconography of Xi’s recent grain belt tour. They are a portrait of his greatness. The construction of the Party’s discipline must uphold Marxism-Leninism, Mao Zedong Thought, Deng Xiaoping Theory, the important thought of the “Three Represents,” the Scientific View of the Development, Xi Jinping Thought on Socialism with Chinese Characteristics for the New Era as the guide, resolutely defending the core status of General Secretary Xi Jinping as the core of the C.C.P. Central Committee and the whole Party, resolutely defending the authority and central unified leadership of the Party’s Central Committee, implementing the overall demands for the building of the Party in the New Era and its arrangements for comprehensive and strict governance of the Party, comprehensively strengthening the construction of Party discipline. Xi’s centrality to the process and spirit of what Party discipline means should be clear in the above passage, which is the first and most obvious revision to the 2015 regulations. The principle may be difficult to understand from the vantage of more democratic systems, where political support generally amounts to a choice among competing discourses and agendas. But in China, the political discourse formalized within the C.C.P. can ultimately be used to send powerful messages about the power and support leaders enjoy, and what course of action is available to them. When Xi is able to position himself as the “core” or include his name in the formulation of a trademark ideology, and when he is able to exact pledges of loyalty that recapitulate this language of power, he can act concertedly—including against his enemies. The “major innovations” the People’s Daily uses to justify why revisions are necessary now are less about discipline than exacting loyalty, and making it crystal clear to Party members where precisely their loyalty lies. The need to turn discipline into loyalty may be the best explanation for the timing of these revisions so soon after the 2015 changes, and the concerted push in related coverage to emphasize greater online discipline. The People’s Daily article quoting the CCDI official on the need to incorporate “major innovations” reported that the revised regulations were deliberated by the Party’s Politburo on July 31. July was by some accounts a tough month for Xi, with growing whispers of pushback within the ranks amid worsening trade tensions with the United States, a slowing economy, and a damaging vaccine scandal stirring up long-buried resentment over poor governance. When it comes to Chinese politics, whispers of palace intrigue are as old as the hills. But in Xi’s “new era,” they may be the best frame we have to explain the urgency of the emperor’s new regulations.